Have you ever heard of or played a domino based board game? Fossil Find combines all the fun of a board game and couples it with dominoes. Players are trying to get either 5 of a kind, a straight or a full house to score points. Beware, there are a few twists and turns on the board. 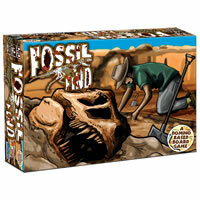 Fossil Find is a great game for younger kids as well as aging adults. Keep your mind active and have a blast doing it. Join in the fun of hunting for fossils in this great archaeology adventure. Purchase your copy of Fossil Find today. Review Completed (2018-09-29) We certainly haven’t played every game out there but we have seen quite a few games in our day. A board game that uses dominoes as its main gaming component is not one we’ve ever seen before. The dominoes are used more like cards and aren't exactly used to make connected domino rows. We were excited to see this game and were so impressed when we received it. 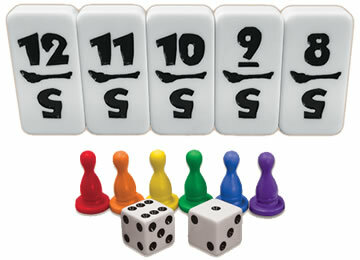 This is a high quality board game with high quality dominoes, storage box and game board. Just the weight of the game alone makes the game feel impressive. With the thickness of the storage box and game board, this game will last a long time. Even the graphics look amazing with the custom dominoes. This leads us to our next topic – the theme of the game. It is obvious that Fossil Find was not just thrown together overnight. We loved how well the theme was integrated into the game. The grave site, the archeology site, lose artifact spots and even natural disasters make this game feel awesome. While setting up the game takes a few minutes, once you’re done the game looks pretty cool. Game play is fun. With the three different point-giving hands that players are trying to collect, it keeps things simple. Throughout the game, you’ll have different chances to collect new tiles to help you make a match (with a hint of poker). The constant help of the dominoes on the board spaces and the help of wild numbers keeps things flowing. The other special spots like the lost artifact, grave robbers, artifact auction and natural disaster are a lot of fun. Some strategy is involved along with a fair amount of luck. We thought the age limit for the game was a little high. Eight year olds could play just fine with some help adding up their score. Contrary to what we normally find, this game plays better with less people. Adding up the score is a little cumbersome (you’re really just counting your tile totals) and we would have like to see some nicely theme artifact-looking score pads to complete the game. Any piece of paper will do. While we’re on the topic of any piece of paper, the game rules were the biggest disappointment. The rules are made from printer paper that looks like it was printed from your printer in black and white. We were shocked to see such a great game have such lousy rules. They are written like a document with a ton of bullet points. They aren’t the easiest to understand either and we had to reference the video which helped us know exactly how to play. By far, the only thing needing improvement in Fossil Find are the game rules. Get a graphic designer to spruce the rules up and you’ve found a real treasure game. 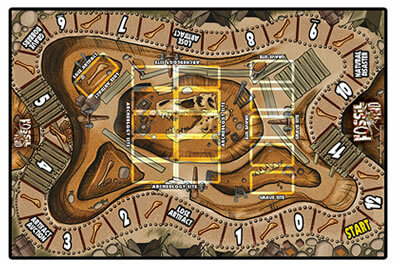 You get 1 game board, 91 domino tiles, 6 pawns, 2 dice and the official Fossil Find game rules and instructions. Please keep in mind that the official Fossil Find board game rules and instructions could be different depending on the game version you have. The rules below are some of the exact directions on how to play Fossil Find. Share with us your comments, funny stories, tips, advice, strategies, creative ways to play, questions about how to play, problems with the rules or anything you want about Fossil Find. All submissions will be reviewed within 24 hours. Click here to add your Fossil Find comments.